KOHLER, Wis. – Nov. 3, 2014 – A leader in bathroom technology, Kohler Co. once again demonstrates its position as an innovator with the launch of the Purefresh toilet seat, featuring built-in technology that deodorizes bathroom air. The Purefresh seat contains a deodorizing system that utilizes a carbon filter to neutralize odorous air. An integrated fan, activated when the user sits on the seat, directs the filtered air over a scent pack located within the system and permeates the bathroom with a light, clean scent. The KOHLER Purefresh technology is featured on the Purefresh seat, as well as the Purefresh Highline Classic Toilet, offering consumers both a seat option or as a complete toileting solution. Homeowners can choose from three available scents for the Purefresh, included with the purchase of the seat: (1) Garden Waterfall, (2) Soft and Fresh Laundry and (3) Avocado Spa. Scent packs are easy to install and refill, similar to the refill method used in standard home air fresheners. Scent pack refills and carbon filter replacements are available for purchase – scent packs last one month on average and carbon filters approximately six months. The Purefresh seat operates on two D batteries for an average of six months prior to replacement. Replacing the batteries, carbon filter and scent packs is an easy task – a gentle push on one of the accessory trays allows the tray to slide out for maintenance without needing to remove the seat from the toilet. 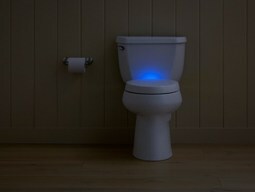 Additionally, the Purefresh seat features a dual LED Nightlight for added comfort during nighttime use. The automatic eight-hour nightlight functions as a task light when the lid is lifted, a guiding light when the lid is closed and is programmed with the push of a button on the first cycle. The seat is also equipped with Kohler’s Grip-Tight bumpers for added stability and to prevent shifting, as well as Quick-Release hinges that allow the seat to be removed quickly for easy cleaning. Quick-attach hardware speeds up the installation process and provides a tight, secure fit while Quiet-Close technology provides for a slow-closing seat and lid to eliminate any slamming.